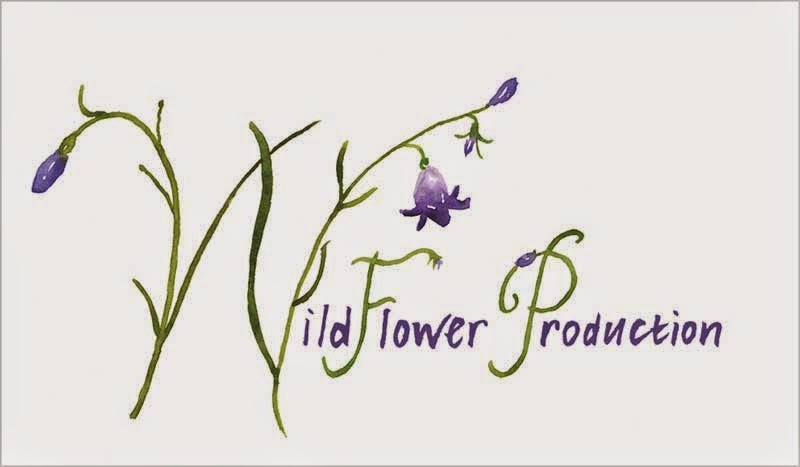 A producer based in Chicago who loves wildflowers so much that her production company is named WildFlower Production contacted me recently, asking if I could paint a logo for her, based on a detail of one of my illustrations she'd seen online. I agreed, on the basis that I'd explore the possibility as an illustrator, as opposed to a perfect resolution from a graphic design point of view. Judith, the client, was happy to go with this as she is a creative herself, and had a strong sense of what she wanted. I began with some research on the main letters. 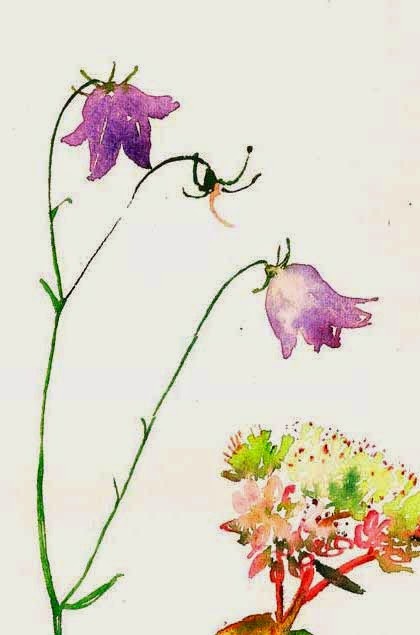 The brief was to form them from campanula stems, leaves and buds. Judith decided she'd like the rest of the lettering to be hand written by me too, so I tried out a few variations. Which turned out not to be that varied at all - it's my own handwriting, after all. I love the meditation of writing over and over again. It always amused me when writing a hundred lines out was meted out as a punishment in school. Duh. Don't you get it? I friggin' LOVE the feel of a pen gliding over paper. Yep, even a hundred times. Though this time I think I probably stopped at 30. 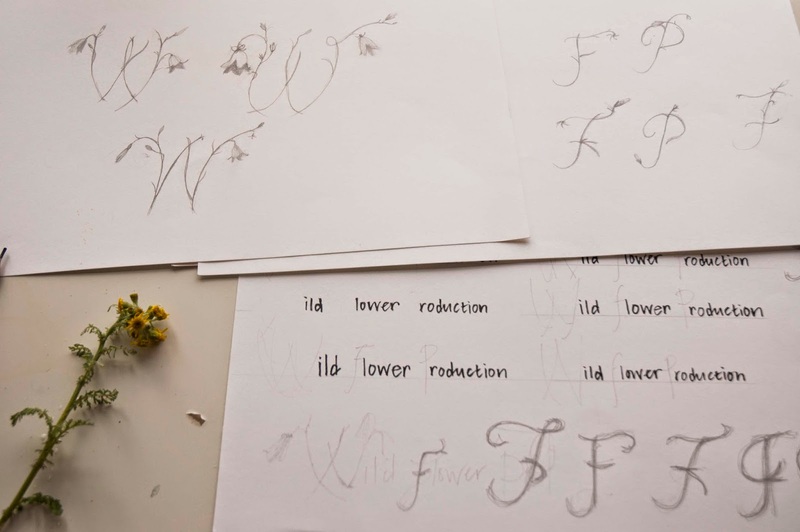 I sent over some pencil roughs before trying out variations of the wildflower letters, which again turned out to be pretty consistent. 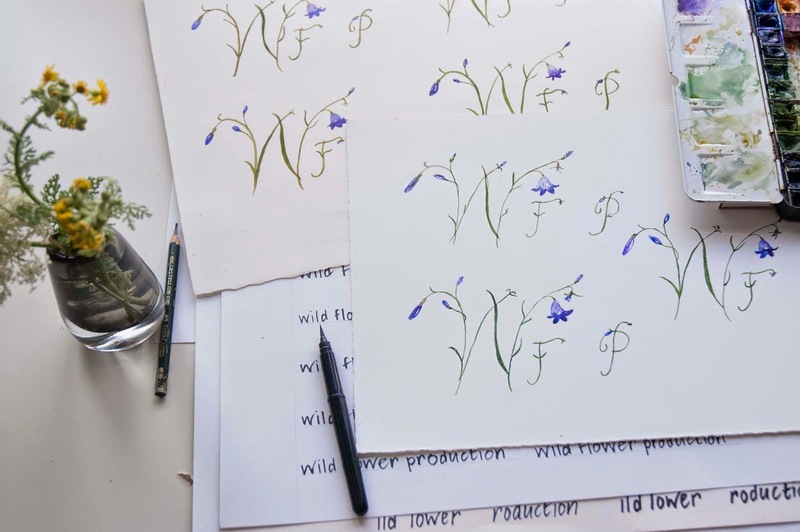 I guess painting wild flowers is a kind of hand writing for me too these days, in a good way. The rest, as they say, is Photoshop. Tweak, nudge, resize, nudge up, nudge down, shake it all around. Pin up on board. Mull. Tweak some more. Save as. Send to client. Nudge and adjust here and there, erase, flatten layers and arrive at a final version at last. Ping over in dropbox. Thumbs up from Judith in Chicago.